One of the most spectacular sites in Turkey especially at sunset. 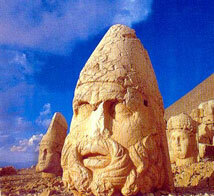 Mt Nemrut (approx. 2552m) is an extension of the Taurus mountain range in southeastern Turkey. After the division of Alexander's Empire into three, the Seleucids established the relatively small and wealthy Commagene Kingdom in the region. In 62 BC, Antiochos I became king of Commagene and developed his kingdom as a strategic crossroad on the important trade routes between Syria, Mesopotamia and Rome. The famous sanctuary was built by Antiochos I for himself as a funerary monument. It is a conical tumulus with a height of 50m and 150m diameter. There are colossal heads of Apollo, Zeus and Antiochos I.